J and I moved our Friday lunch date up by a day because I have to work tomorrow. When she came home from work, she suggested eating out today. She beat me to it by a matter of seconds. I was going to say the same thing. It’s not very often that J specifies either a place or what she wants to eat. She usually lets me pick. What’s funny is the days she does want something specific are usually the days I want a burger. She makes a better case for wanting to eat a little healthier or lighter, so I always go along with what she wants. 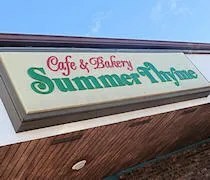 Summer Thyme Cafe & Bakery is in Kalamazoo’s Milwood neighborhood in a small shopping center on Portage Street near Lakeway Avenue. The center is not very big with only four businesses and the parking lot was full. I assumed they were for the cafe and I assumed right. There wasn’t a spot in front of the building, but there is a sign for more parking around the back. We headed back there. The shop has a back entrance with a marker board telling you to head to the front to wait to be seated. You walk through the whole dining room when you do this, but it’s easier than walking around the building. The dining room is much larger than we expected it to be. It’s divided into two sides for no apparent reason. We were shown to a booth that makes up part of the center wall. The guy who seated us set down a couple of menus and silverware. Another lady was acting as the lone waitress. We both started with Coke’s. We chose Summer Thyme because J was leaning towards a salad. They did have one of her favorite salad combo’s (Waldorf Salad on the menu), but there was also a special that was calling her name. She ended up getting a Tossed Salad with cherry vinaigrette. This was brought to the table first not long before our sandwiches were delivered. 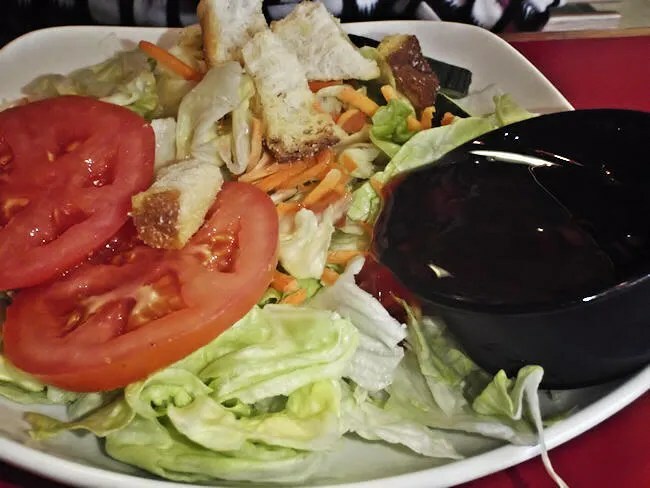 It was a simple salad with tomatoes and croutons, but she really liked the dressing. She was picking up pieces of salad with her fork and dipping them into the container the dressing came in just to get it all out. The sandwich that changed her mind was the Rodeo Wrap. It was a simple chicken wrap with BBQ sauce, lettuce, cheddar cheese, tomatoes and onions. She got a tomato wrap then asked to leave the tomatoes and onions out. Sounds weird, but it’s not really the taste of onions she doesn’t like. It’s the texture of the cold tomatoes and warm chicken. The size was ridiculous. 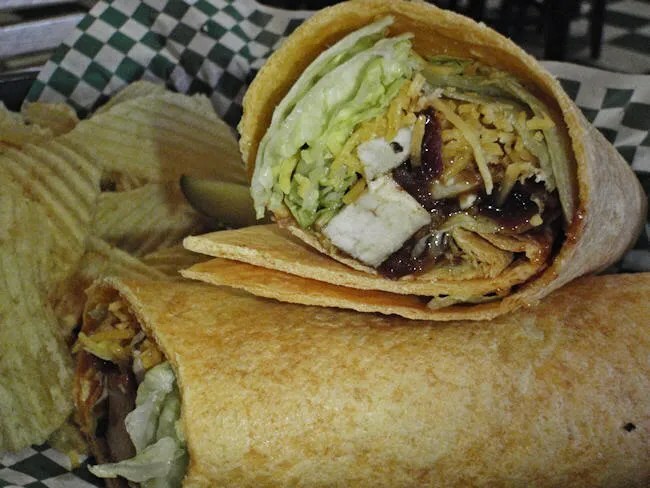 The wrap was served in two halves. Each half could have been a full size wrap on it’s own. She was only able to eat one half. The other half came home for dinner. The wrap came with commercial potato chips and a pickle spear. I ordered the French Dip. 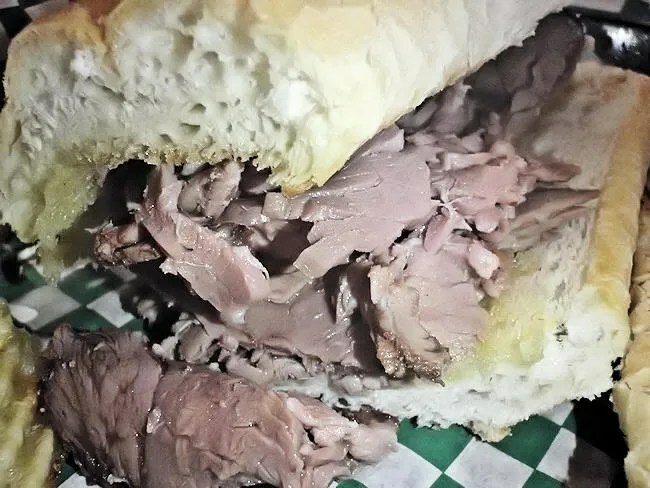 The sandwich is thinly sliced roast beef on a flaky sub bun. A cup of Au Jus is served on the side. The meat was very tender and falling apart when I dipped it into the gravy. I was really surprised, in a good way, with the bun. A lot of places go pretty boring with the bun, but Summer Thyme used a really soft, somewhat flaky bun. It’s a lot more reminiscent of the buns used in Chicago for Italian beef. It’s smaller than that, but it was really good. I polished off my sandwich and my chips before J tried to give me some of hers. There was no way though. It didn’t look like I had a lot of food on my plate, but I was stuffed. I mentioned earlier the waitress was by herself, but you never would have known it. She was running around frantically, but she was doing a really good job of keeping up with everyone. We never had to wait and our meals came out pretty quickly. Th bill was right at twenty bucks. You pay at a cash register near the back of the restaurant and they try to tempt you with dessert. The register is right next to the dessert case and they almost got J. There was a peanut butter bar in there that looked delicious. Still, we got out of there without succumbing to temptation. 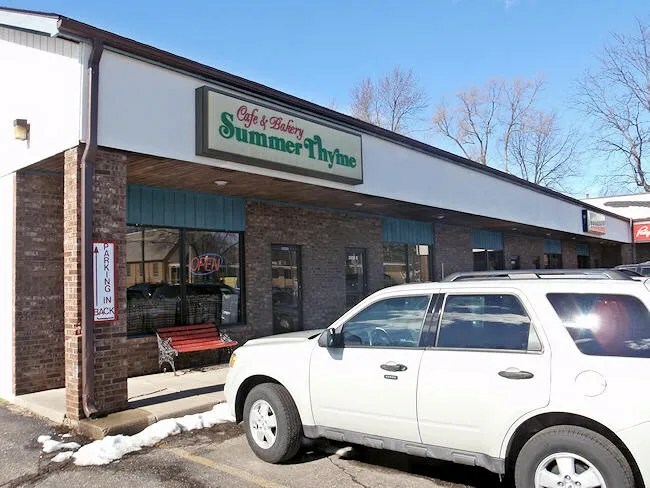 I’ve seen Summer Thyme described as one of Kalamazoo’s hidden gems. It’s in a location that I wouldn’t expect a place like this. I would expect them to be in a downtown area instead of in a neighborhood. The food was great. J was really happy and I left full. That doesn’t usually happen with me at cafe’s.